Attic Ventilation is critical for removing heated air This eases the load on the central air conditioner system, thereby lowering utility bills. Common methods are roof vents and electric or solar-powered fans. Another benefit is the removal of humidity, reducing the possibility of mildew and black mold. Two air flow factors that work together to remove heated air from the interior of the roof to the exterior of the home. The first is the air inflow and the second is the air exhaust. When these two factors are balanced properly, there are two results. The first result is heat reduction. This results in less energy consumption; fewer air conditioning cycles are needed. The second result is that constantly circulating air minimizes the probability of excess humidity and moisture. This greatly reduces the possibility of mildew and toxic mold. Soffit vents commonly used for providing the entry point for outside air into the attic area. These are usually thin, rectangular-shaped rigid-louver vents faced with a screen to keep bugs, birds, and varmints out. Alternately, continuous products such as James Hardie Soffit panels are available, and are really preferable. Either way, they are secured to the horizontal surface of the soffit on the underside of the trusses or rafters. For good air flow, they should be spaced evenly between every other rafter. They're simple to install. For the rectangular ones, mark the spot with a template, then cut the soffit using a jigsaw. Finally, secure it to the soffit covering the hole with screws. Note: its important to make sure that the opening isnt blocked by attic insulation, restricting air flow. Ridge vents. 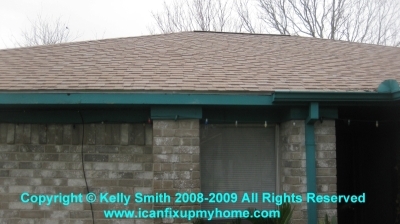 Ridge vents are very common on new construction and when re-roofing. Theyre mounted along the houses roof ridge, like a cap, and blend in perfectly because theyre covered with matching shingles. In some cases, the ridge line is too short to use ridge vents. Turbine vents. This is the most traditional vent. They do a good job of drawing heated air from the attic space, especially with a good breeze blowing. They are also referred to as whirlybird fans. They function in a simple manner; the upper part is a metal globe with fins. The fins are angled to catch the wind and spin the globe on its base. Power roof vent. Power roof vents use a motor pull hot air out of the attic. The upside is that they dont depend on the wind. The downside is that it consumes electricity. The motor is controlled by a thermostat mounted inside the attic. Solar powered roof-mount attic vents. These devices are like the electrical-powered model except that theyre powered by a small solar panel. This means they conform to green-building practices since they use a renewable power source. Gable-mounted power attic vents. just like the power vents explained above, two types of gable-mounted units are available. The first is wired to the homes electrical circuits and the green model is solar-powered. So whats the difference? Theyre mounted vertically on the gable, the triangular wall area between the two sides of sloping roof line. The more expensive models include a humidistat in addition to a thermostat. Need a New Roof or Shingle Repair?